How to cook chicken wings? This certainly was not a question that I ever heard when I was young. As a matter of fact no one ever wanted to eat the chicken wings. Usually Mom would cook some type of a “pot meal” with the chicken to make it feed more people. In our large family, when Mom fried chicken, it was a “battle” NOT to end up with a chicken wing; that is everyone except Sister Gloria. She was the only person that I knew who liked chicken wings. When Mom fried chicken and she felt she had plenty to feed everyone, the wings went in a pot with the necks and backs to cook into rich chicken broth. This broth would then be used to cook noodles, dumplings or to make a pot of soup. We always used every part for something! I do know of “town people” who would throw these parts away; yes, even the now loved chicken wings. Oh, how times have changed. The popularity of chicken wing recipes has been one of the greatest changes in my cooking life. Years ago I could never have imagined how much people love chicken wings now. Even me; I have not tasted any that I did not like. I think this popularity came about with the hot spicy Buffalo wings which came out of Buffalo, New York. Even though I have read this new food originated in the late 1960”s, it was not until the early eighties that I had the pleasure of tasting when I moved to Orlando. Like everyone else I was hooked! Like everyone else also I was looking for other ways of preparing these tasty little pieces of the chicken. How to cook chicken wings became one of the most frequently asked question in the food world. Up until The Buffalo wing recipe was released around the country you could get wings at the grocery for almost nothing. Even until the last five years I could get bags of them at a very reasonable price. These were the WHOLE chicken wings. This included the “tip” of the wing which the recipes generally instruct you to cut off and discard. Even so, the price I paid was still very good. 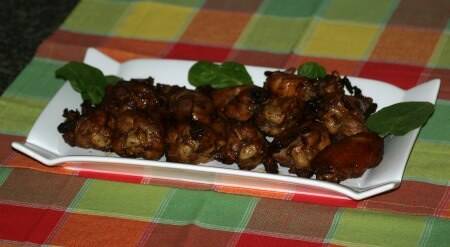 When you learn how to cook chicken wings you can use them for delicious appetizers or as a main entrée. This is how to cook chicken wings hot. I found the hot wings very easy to make; I do not know how I got started but here is how I still make them. Wash wings and pat dry on paper towels. Drop wings in hot cooking oil and fry until golden brown; remove from oil and drain. In a saucepan melt 2-3 tablespoons butter, add 1 tablespoon vinegar and a bottle of hot sauce. NOTE: I use Crystal brand of hot sauce. Heat mixture to hot and pour over the cooked wings; toss wings to coat. This is how to cook chicken wings with honey. 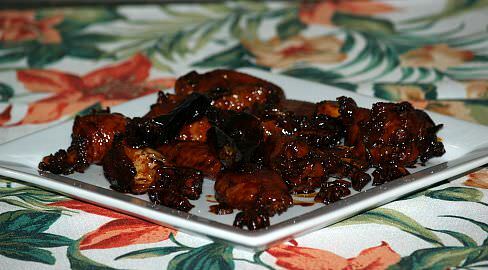 Sprinkle wings with salt and pepper; combine honey, soy sauce, oil, catsup and garlic and blend. 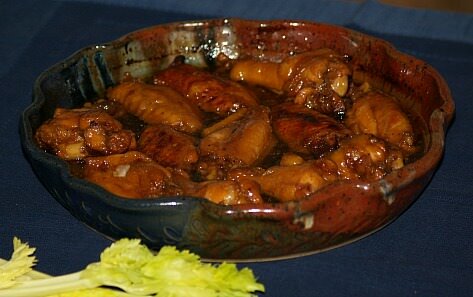 Place wings in a shallow greased casserole dish. Bake 1 hour until chicken is done and sauce has caramelized. This is how to cook chicken wings hot and spicy! After discarding chicken wing tips separate between the first and second joints with a sharp knife. Rinse wings in fresh water and pat dry with paper towels. Heat about 2 inches of oil in a heavy saucepan to about 350F degrees. Fry a few wings at a time until golden brown about 6 minutes. In a small saucepan combine melted butter, Tabasco sauce, catsup and garlic powder; blend well. 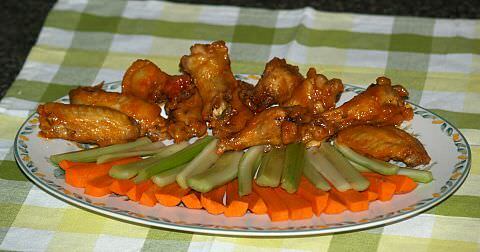 Pour mixture over fried wings; toss and serve; makes 24 pieces. Place chicken wings in a shallow dish; mix remaining ingredients and pour over the wings. Cover and refrigerate at least 1 hour turning chicken occasionally. Line broiler pan with foil; arrange chicken on the rack (Top) of the foil lined pan. Use RESERVED MARINADE for brushing the chicken as it bakes. Bake chicken for thirty minutes; turn chicken over and bake thirty minutes longer. This is how to cook chicken wings as an entree. Combine wing pieces with salt, sugar, soy sauce, wine and cornstarch; let stand 10 minutes. Preheat wok or skillet over high heat; add oil and heat. Add seasoned wings; stir fry wings until they start to brown and remove with slotted spoon. Add garlic and onions to the wok to flavor oil; add wings back in and a little water. Stir wings, cover and cook over medium high heat for 5 minutes. Remove cover and stir gently to keep from sticking; add more water if necessary. Cover again and cook 5 to 10 minutes longer until sauce is almost entirely absorbed. Add sesame oil and stir gently; serve hot. 4 to 6 Servings. 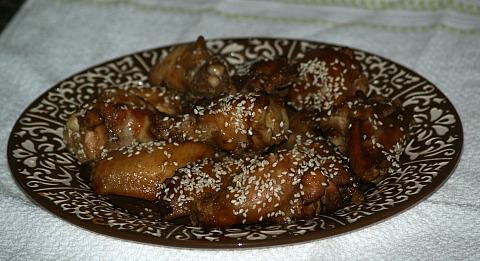 This is how to cook chicken wings with sesame seeds. Place wing pieces in a dish. Combine and blend ginger, mustard, brown sugar, soy sauce, oil and garlic. Pour mixture over chicken; cover and marinate in refrigerator overnight. Remove wings from marinade and place in a baking pan. Bake 30 minutes; turn wings over and bake another 30 minutes. 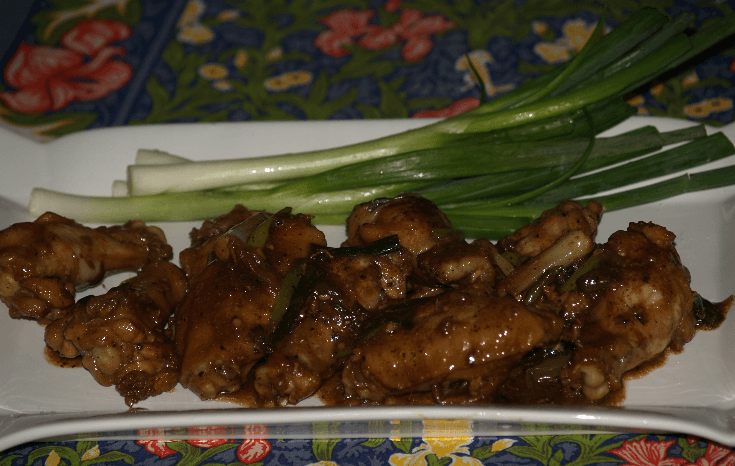 Sprinkle wings with sesame seeds and return to oven another 5 minutes. Use as an appetizer or serve as a meal with rice. 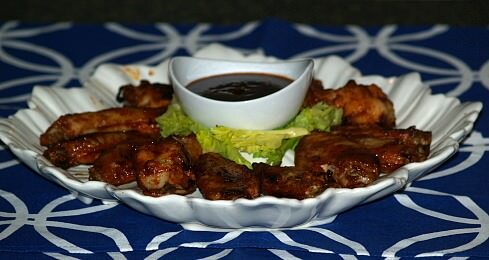 This is how to cook chicken wings with barbeque sauce. Combine chili sauce and syrup; set aside. Heat broiler; line bottom of broiler pan with foil. Grease top of pan; place chicken on top. Broil 4 to 6 inches from heat for 15 to 20 minutes or until no longer pink turning often. BRUSH OFTEN WHILE COOKING WINGS. Heat remaining sauce to serve with wings. NOTE: Try this recipe on your outdoor grill. In a small saucepan combine both soy sauces, sugar, peppers, ginger, garlic, anise and peanut oil. Simmer mixture for 15 minutes. Bring mixture to a boil and drop in the chicken wings. Cover and then turn off the heat; simmer for 10 minutes. NOTE: You can substitute all key lime (marmalade, juice and peel) with lime or lemon. 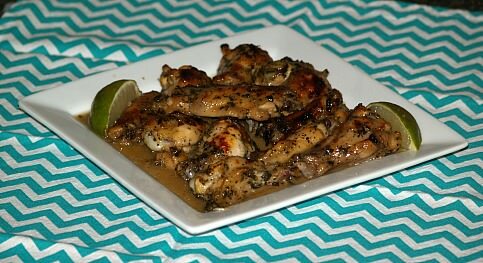 Learn how to cook chicken wings with a taste of the Keys! 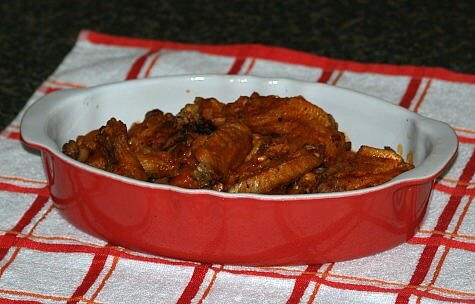 Place chicken wings in a large shallow glass baking dish. Mix tequila, chopped cilantro, 3 tablespoons marmalade, oil, 2 tablespoons juice, pepper, garlic, Tabasco, salt and ½ teaspoon lime peel in a small bowl. Pour mixture over the chicken; cover and refrigerate the chicken overnight turning chicken several times. Remove chicken from marinade and arrange in a large shallow baking pan; bake 30 minutes turning chicken occasionally. Strain the marinade into a heavy saucepan; boil until mixture is reduced in half about 5 minutes stirring. Add remaining 4 tablespoons of marmalade, 2 tablespoons key lime juice and ½ teaspoon lime peel. Boil another minute and brush marinade over the chicken. Oil broiler pan and place wings on pan. Preheat broiler; broil chicken 6 inches from the heat source until crisp and brown turning several times. These can be made a couple hours in advance, cover with foil and place in warm oven. Place wings on platter to serve and add garnishes.